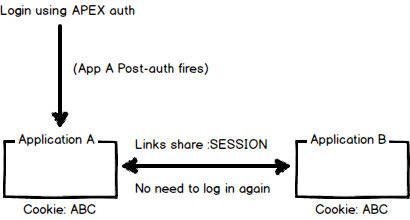 Quite a few times I see a questions regarding how to share authentication between Oracle APEX applications so the user does not need to log in a second time. 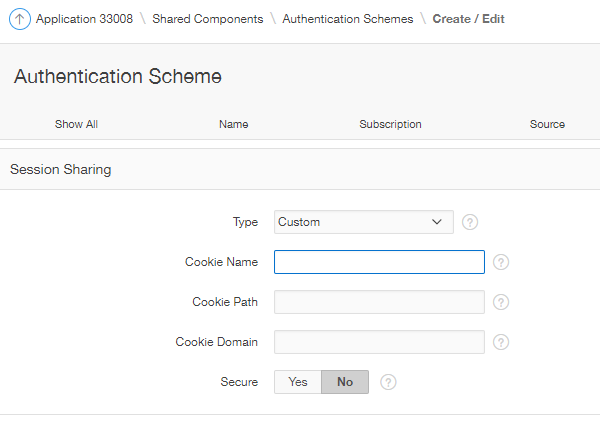 As long as your link between the applications share the session ID, the solution is simple - set the cookie name the same across your applications. This can help release management as you can modularise your applications. You could have a simple login/menu application that links to all your other applications. If you wanted you could provide access to your application suite using different authenication mechanisms. ie - if you log into application B using DB accounts, you can still hop across to application A. The drawback I've found is that post-authentication will only fire during your initial login (in the relevant application). This means you need to be aware how to handle and share your authorisation mechanisms. If you're on 18.1 (5.2), you may be interested in the Social Login feature. Dimitri has a detailed post. If you're on 18.2, you'll need to set Type to 'Custom', or (carefully) consider the Workspace sharing option. (Oct18) I'm currently writing a presentation on this topic, stay tuned. "The drawback I've found is that post-authentication will only fire during your initial login (in the relevant application). This means you need to be aware how to handle and share your authorisation mechanisms." I invoke a common 'on new instance' procedure that handles the initial login, and it also invoked via an 'on new instance' application process for each application. But, there is a new application process that runs 'after authentication'. I am yet to test if this would be a suitable replacement, but I don't think so.